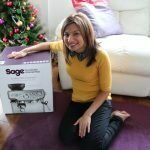 However, I must have been a good girl all year as the lovely folks at Sage Appliances gifted me The Barista Express, to review, and in terms of timing it arrived just before Christmas. I was so excited to unbox it and set it up. It was all smartly packed in and as we took each component out, I got even more impatient to try it out as it had all these fabulous accessories. It is such a perfect size and now sits proudly on my kitchen counter and has made my kitchen look that much more snazzier. In anticipation for its arrival, we had bought some fair trade coffee beans. To set up the machine didn’t take long at all and the instruction manual was so easy to follow! What impressed me straight away was how cleverly it is made so that it is such minimal effort to clean. It even has an inbuilt storage compartment to keep the cleaning kit, which comes with it. We let it go through the first test run as advised, and then mugs at the ready, we were good to go to make our first coffee with it. Ladies and gentlemen, it is frickin’ awesome! In around 1 minute we had the perfectly brewed cup of coffee from bean to cup! It takes more time for me to make my cup of coffee with the kettle and a jar of instant coffee at times. The even more amazing part is that the kitchen is filled with this wonderful aroma of freshly brewed coffee – the kind that hits you when you walk into a coffee shop. I have never fallen in love with an appliance so fast before! So to take you through the process, we first filled the top of the machine (called the hopper) with coffee beans and then selected the grind amount. There is an inbuilt conical burr grinder with a customizable dose control. It delivers exactly the amount you need per cup into the portafilter. You can vary the grind size, from fine to coarse, to suit your taste. You instantly get that amazing aroma and it lingers on for longer than when you have opened your instant coffee ground a few times. Plus it is so much fresher and it is so easy to do – the machine does all the hard work in a matter of seconds. One of the accessories is the The Sage Razor™ dosing tool, which you use to trim the puck for a consistent dose and extraction. It is rather therapeutic to use too. You also get a tamper to push it all down, which attaches to the machine magnetically. You then click the portafilter into place in the machine, select either a single or double espresso, place your coffee cup on to the tray and watch the machine work its magic. The next step is to add the hot water, if you want to make a regular coffee or Americano. The machine has hot water dispensing literally straight away so there is no waiting around waiting for it to heat up. This is all down to the digital temperature control (PID), which delivers the water at precisely the right temperature, ensuring optimal espresso extraction. Now the most fun – frothing the milk! I love that sound when you are in a coffee shop waiting for your coffee and you can see the Barista frothing the milk and then layering your cup with that milky goodness. This is perfect for making Cappucinos or Lattes. The Barista Express has a steam wand attached to it that allows you to skillfully hand-texture the micro-foam necessary with the accompanying stainless steel milk frothing jug, to enhance the flavour of the coffee and create latte art. I still have a long way to go with the latte art but the foam part is super fun. I couldn’t get over how quick the process was to make a cup of coffee. It has definitely been a crowd pleaser over Christmas and the taste of the coffee is just so unbelievably good. It is just like having a luxurious coffee shop style cup at home, in a minute! I don’t think I can revert back to instant coffees anytime soon as there is literally no excuse not to use the machine. I have thoroughly enjoyed my morning coffees even more now and sometimes cheekily brew an afternoon mug when I am working from home too. I have been experimenting lots with my Barista Express so look out for some recipes to add some sparkle to your cups of coffee. One delicious way to have a super special mug is to add some (naughty) After Eight sticks to it. SO DELICIOUS! Especially as an after dinner treat. Seriously if you are after a really good Coffee machine invest in the Barista Express – it is so well built, has a solid structure, looks so elegant, is so easy to use and sounds just like a professional coffee machine as it is pretty much the same as a commercial one but in a much more compact and convenient size. It is so much fun trying out the different grind sizes and different coffee types to find the ones we love best. What blew me away was how quick it is to make a cup of coffee from grinding the beans to adding the froth! It is so good if you take a coffee with you on your commute as it tastes so good and what better way to start your day? 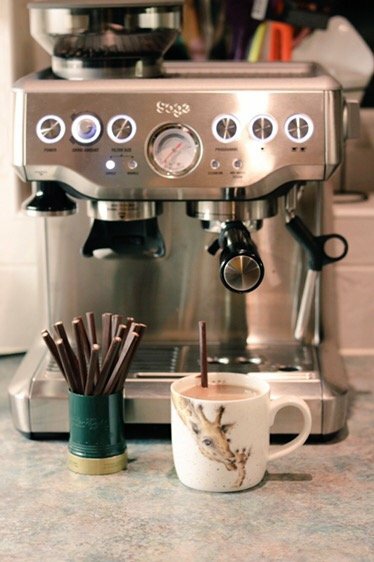 The Barista Express currently retails at £549.99 and is seriously worth it! I have slowly become a Sage Appliances convert, as my Kettle and Toaster are also by Sage Appliances. It is one of those things that you never knew you needed till you get it and then you can’t live without it and wondered what you did without it! I can’t emphasise how easy it is to use the Barista Express and how delicious the coffee is. If you are a coffee lover, this is a must have! Not only will your home (or office as this is perfect for that too) smell amazing, you will absolutely love every single mug of coffee you have from it! 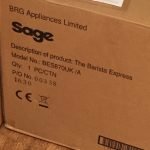 For more information about The Barista Express and Sage Appliances go here. Disclaimer: I was gifted The Barista Express from Sage Appliances. All views and photos are my own. This is so useful, I got love a really well made coffee. And OMG your giraffe mugs!! I’m coming over for a cuppa next time I’m in London! I really need this in my life! I could have home-made frothy lattes everyday. You will never be deprived of a good cup of coffee now. Lucky, lucky lady.